Why do businesses love Valentine’s Day? Let us count the ways. The day turns love into a holiday and a reason and season to spend. It lets shoppers know they should show they care by sending and spending on gifts. And this message is sent unconditionally, to women and men, young and old, and even kids and pets. Yet while shoppers are searching and spending on presents, it’s businesses that get the best gift. This year, Valentine’s Day spending should reach $17.3 billion, according to the National Retail Federation. While flower shops and candy stores always get lots of love, the day presents many ways for businesses to feel the love in sales. Today, businesses are more creative than ever with their love-laden promotions. Now when love is in the air, it’s also on their menus, on stores shelves, on signage, on websites, in specials, in emails, on contests, and on many social media pages for every kind of business. And while the day may be ribboned in red and pink, businesses turn it into green. So while shoppers are wrapping their Valentine’s presents, we’ve packaged together a list of why businesses get the best gift of all. 1. A fancy dinner is a must for many, but now quick-serve chains vie for affection by rolling out specials all month long, according to QSRMagazine.com. On Valentine’s Day, White Castle gets dressed to impress by hosting a white-tablecloth dinner with tableside service and a special menu that inspires many diners to get dressed up themselves. Other chains like Bojangle’s, Dunkin’ Donuts, and Krispy Kreme offer limited-time items throughout the month shaped liked hearts for the holiday. These promotions do more than win hungry hearts, they also spark lots of social media buzz, stimulate word-of-mouth publicity, and increase sales. 2. For those who prefer fine dining to fast drive-thrus, many restaurants present special Valentine’s Day menus that bring in the diners and dollars during a typically slow winter month. Most offer prix-fixe menus at higher prices, yet to stand out from other enticing options, some treat ladies to roses or offer gift cards for future meals. 3. Many stores showcase the signs of love by showing it in their signage. They dress up their windows for Valentine’s Day by putting up signs about special deals or featuring items that make great gifts. Some get carried away, reports eHow.com, by crafting displays in every department filled with seasonal items that tempt love-struck shoppers. 4. Love may be a tangled web, but businesses know that their websites make it simple to show specials for the season. These sites highlight products for Valentine’s Day, with their best deals on the homepage and clear deadlines for orders and shipping. Some go all out with gift-finder tools or gift guides that point out the perfect present. These make it easy on shoppers and sweeten the website’s sales. 5. Today, more and more businesses send the modern version of a love letter—the email. These emails promote their products as Valentine’s Day gifts or announce their love-themed specials. To arouse the desire to buy, they position these propositions as the quick click for last-minute gifts or the perfect present for picky partners. 6. To ensure a deeper digital connection, businesses know that the right search engine keywords are the key to hearts and sales. But since ranking for terms like “Valentine’s gifts” is competitive and costly, GetElastic.com suggests adding local keywords to a seasonal search campaign for greater results and less pay-per-click rivalry. Just like love, it may take some extra time and effort, but it will pay off in the end. But if a business wants instant gratification, they can seek out sites ranking well for seasonal search terms and simply add their products through the merchant center. 7. Since Valentine’s Day is a social event, social media is the perfect way to get in on the celebration. Many businesses turn to Facebook, Twitter, and other networks to promote special deals or launch love-themed contests that connect them to the day. With the latest social media advertising options, businesses can send out targeted ads to shoppers who crave just what they sell. 8. And Valentine’s Day isn’t just for consumers. Many B2B businesses find ways to leverage the love. Some sweet ideas from ModernMarketingPartners.com include sending a thank-you gift to customers, making a heartfelt donation to charity, wrapping up orders in red, or giving discounts for recent referrals. It’s easy to see why businesses adore this day of affection. It drives millions of shoppers to purchase presents and that’s the greatest gift a business can get. 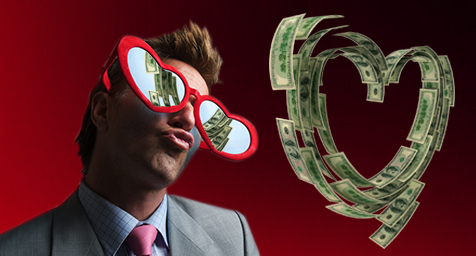 Perhaps there’s no better day than Valentine’s Day for showing that money can buy love. Discover the secrets of successful marketing. Contact MDG Advertising today at 561-338-7797 or visit mdgadvertising.com. MDG Advertising, a full-service advertising agency with offices in Boca Raton and New York, NY, is one of Florida’s top branding firms. MDG’s capabilities include print advertising, direct mail marketing, branding, logo design, creative, digital marketing, media buying and planning, radio and TV advertising, Web design and development, online video advertising, email marketing, content marketing, social media marketing, and SEO. To learn about the latest trends in marketing and advertising, contact MDG Advertising today at 561-338-7797 or visit mdgadvertising.com.